Preserve & Maintain Lexington's Brick Sidewalks - Don't Tear Them OUT! Lexington's historic Center along Massachusetts Avenue belongs to us all. 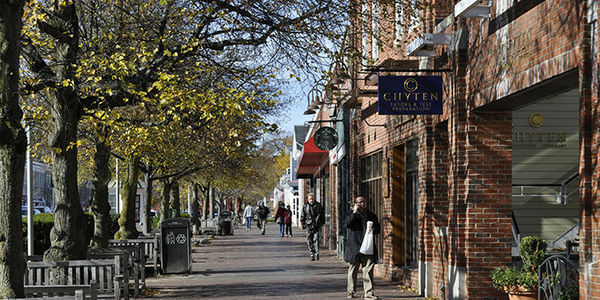 The proposed Center Streetscape project, an $8 - 12 million renovation will come before the town's financial committees, the Board of Selectmen and Town meeting either in whole or in 3 phases for approval. The plan includes the Center&rsquo;s streets, sidewalks and crosswalks and other safety measures. A portion of the current plan calls for tearing up all existing brick and concrete sidewalks on both sides of the Avenue from the Battle Green to Woburn Street. The new sidewalks will have wide stripes of concrete edged with new brick. The justification is to render the Center&rsquo;s walkways more accessible and visible to the disabled. As we mark the 50th anniversary of the center&rsquo;s 1960&rsquo;s renovation - &ldquo;Lexington Center Mall&rdquo;, we believe a better approach is preservation and maintenance. Large sections of our brick sidewalks are relatively new and other sections including these older bricks have shown remarkable resilience. Preservation and maintenance do not have to be incompatible with the goals of SAFETY and ACCESSABILITY. It requires creativity and openness to arrive at the most effective solution. We need a long term, economical and safety approaches that will benefit all. We urge that the current brick sidewalks be preserved and brought up to ADA standards where necessary. Bricks that are ADA compliant can be installed in such a way as to make the walkways smooth and visible. Safety measures for walks, ramps, and crosswalks can also be achieved without disturbing the current walkways. Depending on how it is financed, the Streetscape project will take around a year to 3 years at a cost of estimated $8-12 million, much of it devoted to replacing the brick walks. We think this expenditure is neither necessary nor a priority for our strained tax dollars. Upcoming Public Meetings - URGENT ATTENDANCE - LAST CHANCE to Speak Out! Wednesday January 11, 2017, 7 pm, Battin Hall. PUBLIC COMMENT WELCOME! 2. Ad Hoc Presentation to the BOS -Monday, January 23, 2017. Board will hear the report -NO public comment. 3. SPECIAL BOS meeting on Monday, January 30, 7 pm, Battin Hall. Deliberation on Ad Hoc report. PUBLIC COMMENT WELCOME! Stop the Demolition! We must keep the pressure ON! Request a lawn sign. Email Town Meeting Members and tell them NO to this current wasteful Streetscape Plan! go to SAVEHISTORICLEXINGTON.ORG for their emails. Please look for us at DISCOVERY DAY to learn more about our efforts!